Summary: A princess must find her place in a reborn world. We are introduced to Princess Lia. She longs for a normal life, one where she doesn’t have to marry some old prince. Lia is promised to a prince to make things better but in her mind she doesn’t want to do it. She wants to live her own life, and make her own decisions regarding love. So, what does she do? She flees along with one of her friends; girl who works in her home. Man, I could write a book on this one. She ends up in a small little village and starts working waiting on tables. She also meets two men. One is an assassin sent to kill her and the other is the very Prince she was supposed to marry. Of course, she doesn’t know either of these details. And as readers, we don’t know which is which! It switches between points of view and we get to know one as Kaden and one as Rafe. But for a long time there is no way to know which one is the Prince and which one is the Assassin. Talk about drama. I had a hard time choosing because I liked both guys. Each one had their own interest in Lia and I liked getting to know both. Of course things don’t go right for Lia and she is forced to flee again. This time she gets kidnapped and has to deal with the salvages! This one had so many interesting plot points. I loved that the setting did change and we learn more about Lia and both men. I loved how much action there was. But, there was also sadness for Lia’s family. Gee Whiz that made me want to cry. The Kiss Of Deception was such a marvelous read. I’m glad I finally read it. I didn’t realize just how much I was going to enjoy it! Overall: Loved the characters and the plot! I highly recommend this one! If you haven’t read it yet, please do it right now!!! Cover: Like it but it wasn't enough to draw me in and that's probably why it took me a while to get to it. Its alright. The Kiss of Deception transcends the young adult age group. It's a story that can be enjoyed by any one of any age. It's a perfect example of what a high fantasy book should be like. 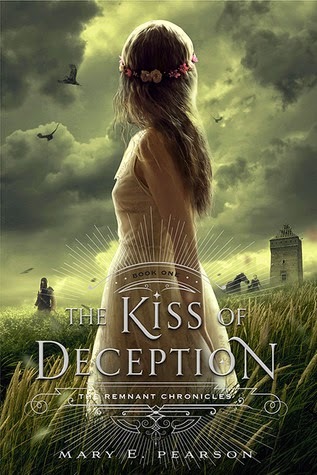 If you've never read a fantasy book but you're curious about the genre, read The Kiss of Deception. It's the perfect introduction to an amazing genre.